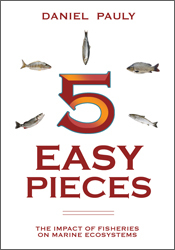 I’ve just finished Daniel Pauly’s 5 Easy Pieces: The Impact of Fisheries on Marine Ecosystems , a collection of Pauy’s five most influential journal articles along with commentary and narrative. All in all, I highly recommend the collection to those new to marine policy and science. The commentary also has some things of interest for those seasoned in the field. I picked up this short book originally as a way to refresh. I thought, “it’s been a while since I’ve read most of these articles.” I was soon surprised to find that this collection is so much more than the sum of its part. This is because Pauly provides a unique window into the social processes of how marine science advances. Each chapter presents the full text of one contribution, as well as its origin and context, mostly in the form of comments by scientific colleagues, both positive and negative. Also, responses are provided to these comments, and the reception of each of these five contributions in popular media is documented. This provides an opportunity to present, among other things, my views on the extent to which scientists are justified in shaping, by interacting with popular media, the reception of their own, perhaps controversial results. Pauly, if you don’t know, has been one of the most vocal and controversial figures in marine science and policy over the past two decades. In my view, his only rival is Ray Hilborn, who sits on the other side of the ideological divide in fisheries science (more on that here). I’d say that controversy has mostly followed Pauly as a result of all the egos he has bruised. For a long time, the establishment was getting the science quite wrong (as the third article shows in particular). Daniel Pauly and Villy Christenson. 1995. Primary production required to sustain global fisheries. Nature (374): 255-257. Available to read here. Daniel Pauly, Villy Christensen, Johanne Dalsgaard, Rainer Froese, and Francisco Torres Jr. 1998. Fishing down marine food webs. Science (272): 860-863. Available to read here. Reg Watson and Daniel Pauly. 2001. Systematic distortions in world fisheries catch trends. Nature (414): 534-536. Available to read here. Daniel Pauly, Villy Christensen, Sylvie Guénette, Tony J. Pitcher, U. Rashid Sumaila, Carl J. Walters, R. Watson and Dirk Zeller. 2002. Towards sustainability in world fisheries. Nature (418): 689-695. Available to read here. Daniel Pauly, Jackie Alder, Elena Bennett, Villy Christensen, Peter Tyedmers, and Reg Watson. 2003. The future for fisheries. Science (302): 1359-1361. The lesson: in individually pitching to these media, it helps to know the angle each favors; a quick Google search can usually reveal the types of story each tends to report. My only critique is that the commentary gets less substantive/interesting as Pauly discusses more recent articles. I believe part of this is due to the fact that he has learned most of his ‘lessons’, and another part of this is the mainstreaming of his message that global fisheries are in trouble. I wonder if he might have broadened his commentary to talk about the present ideological divide or the institutional ties he has cultivated to shape conservation campaigns. The big takeway from the book is that Daniel Pauly has had a profound, positive impact on fisheries science because he is not only a brilliant scientist, but also a clever and strategic communicator. I’ll say it again: this is a very good, quick read. Great post . . . I am going to see if my local library can get this for me!